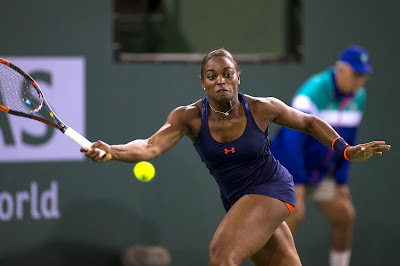 Sloane Stephens is more volatile than the stock market. The 25-year-old Fresno product fell to Donna Vekic of Croatia 6-1, 6-3 in 71 minutes today in the first round at Wimbledon. In the last four Grand Slam tournaments, Stephens has alternated between reaching the final and losing in the opening round. She won the U.S. Open last September for her first major title, fell in the first round of the Australian Open and lost in the final of the recent French Open. Stephens, seeded fourth at Wimbledon, committed 22 errors to Vekic's six. The 5-foot-10 Vekic (1.79 meters), ranked 55th, won 87 percent of the points on her first serve (20 of 23) but had no aces and nine double faults. She won one of her two WTA titles on grass last year at Nottingham. As usual, Stephens took her loss in stride. "It's unfortunate," she told reporters. "She played well. It was not too much you can do. I'm not going to, like, go cry and bang my racket. No. Look what happened; what did you learn? Let's work on it. Can't dwell on it. Can't take it back." Also upset today were No. 5 Elina Svitolina, No. 16 CoCo Vandeweghe and No. 19 Magdalena Rybarikova. Tatjana Maria, a 30-year-old mother from Germany, toppled Svitolina of Ukraine 7-6 (3), 4-6, 6-1. Maria won Mallorca on grass two weeks ago for her first WTA singles title. Katerina Siniakova, a 22-year-old Czech, outlasted Vandeweghe, who has reached two Grand Slam semifinals and two Wimbledon quarterfinals, 6-7 (3), 6-3, 8-6 in 3 hours, 2 minutes. Vandeweghe hurt her ankle in the first-set tiebreaker. The two-time Stanford runner-up is scheduled to play in the inaugural Mubadala Silicon Valley Classic, July 30-Aug. 5 at San Jose State. Sorana Cirstea, a 28-year-old Romanian, ousted Rybarikova, a Wimbledon semifinalist last year, 7-5, 6-3. Agnieszka Radwanska, seeded 32nd, narrowly avoided an upset. The 2012 runner-up to Serena Williams saved six match points in a 6-3, 4-6, 7-5 victory over 20-year-old qualifier Elena-Gabriela Ruse of Romania. Advancing were No. 9 seed Venus Williams, No. 10 Madison Keys, No. 25 Serena Williams and unseeded Victoria Azarenka. All are entered in San Jose. On the men's side, 11th-seeded Sam Querrey dismissed Jordan Thompson of Australia 6-2, 6-4, 6-3 in 1 hour, 30 minutes. The 6-foot-6 (1.98-meter) Querrey slugged 15 aces and won 93 percent of the points on his first serve (39 of 42). Querrey, a 30-year-old San Francisco native and 2017 Wimbledon semifinalist, is scheduled to face Sergiy Stakhovsky, a 32-year-old wild card from Ukraine, on Wednesday. Stakhovsky stunned Roger Federer in the second round at Wimbledon five years ago. Querrey is 3-1 against Stakhovsky, who won the last meeting in the first round at Indian Wells in 2015. Mackenzie McDonald, a 23-year-old product of Piedmont in the San Francisco Bay Area, defeated Ricardas Berankis of Lithuania 4-6, 7-6 (6), 6-3, 7-6 (6) in a 2-hour, 52-minute matchup of diminutive players. It was McDonald's first main-draw victory at Wimbledon and second in a Grand Slam tournament. Ranked No. 103, he will crack the top 100 for the first time when the rankings are updated on July 16. McDonald will meet Nicolas Jarry, a 22-year-old Chilean, for the first time. The 6-foot-6 (1.98-meter) Jarry, ranked No. 66, ousted 28th-seeded Filip Krajinovic of Serbia 6-3, 3-6, 7-6 (5), 6-4 for his first Grand Slam victory. In a battle of spectacular one-handed backhands, Stan Wawrinka eliminated sixth seed and 2014 semifinalist Grigor Dimitrov 1-6, 7-6 (3), 7-6 (5), 6-4. Wawrinka, a three-time Grand Slam champion, had two knee operations last August and sat out for three months this year to work on his fitness. Daniil Medvedev, a 22-year-old Russian, knocked off 16th-seeded Borna Coric of Croatia 7-6 (6), 6-2, 6-2. Coric, 21, ended Federer's grass-court winning streak at 20 matches to win Halle (Germany) two weeks ago. Winning in straight sets were No. 1 seed Federer, No. 3 Marin Cilic and No. 13 Milos Raonic. Futures Circuit -- Sam Riffice, a rising freshman at Florida from Roseville in the Sacramento area, lost to seventh-seeded Marc-Andrea Huesler, a 6-foot-5 (1.96-meter) left-hander from Switzerland, 6-4, 6-2 in the final of last week's $25,000 Tulsa (Okla.) Pro Championships. Riffice, 19, beat Mikael Torpegaard of Denmark 7-5, 6-1 in the quarterfinals. Torpegaard, who recently completed his eligibility at Ohio State, reached NCAA finals in singles in 2016 (losing to McDonald) and doubles this year. For those who are searching to Live Stream Wimbledon Free must visit this guide. Here is a complete solution for that.